TMBA is the New York animation studio that created the "physics behind the stunts" animations for Discovery Channels "Stunt Junkies" TV show. In this stunt, Luigi Cani rides a motorcycle into the grand canyon to perform a 200 ft BASE jump while wearing a wingsuit. In this never-before-attempted stunt, Luigi Cani will BASE jump off a cliff with a speed bike; however, instead of going down with the bike, with the help of a specially designed wing suit, he will fly up and away from the bike. 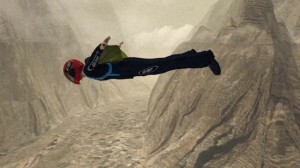 Luigi is the only athlete known to date that has worked with the specially designed wing suit, which enables him to fly up and away from an object rather than down. Another twist? Luigi has never BASE jumped before! So, he'll need to start with a basic BASE jump course to prepare for the stunt. From there he will do several high-speed skydives wearing the special wing suit in order to train his body for flight position with great horizontal projection. 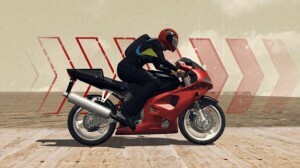 Then, he will do test rides with the motorcycle wearing the special suit and the BASE harness to make sure that he will not be lifted up and off the motorcycle while riding at high speeds. A wingsuit flier manipulates the shape of his body to create the desired amount of lift and drag although most wingsuits have a 2 to 1 ratio. This means that for every foot they drop, they go two feet forward. 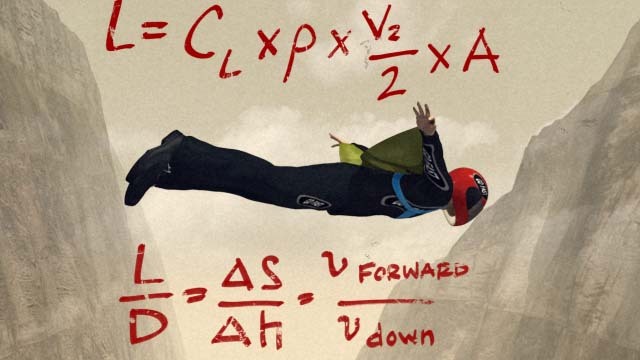 With body shape manipulation and by choosing the design characteristics of the wingsuit, a flier can alter both his forward speed and fall rate. A pilot can choose to manipulate his fall rate towards Earth with the goal of achieving the slowest vertical speed in order to prolong time in freefall, or the pilot can try to maximize the horizontal glide distance across the Earth. the shape of his torso, arching or bending at the shoulders, hips, and knees, and by changing the angle of attack in which the wingsuit flies in the relative wind, and by the amount of tension applied to the fabric wings of the suit.